Previous PostHoliday Blues, Chargen, and ContextualizationNext PostStance Crap and Authorial Intent. Oh yeah. I should do this myself, but I’m nodding along here. That is some damn fine design on those character sheets. That’s *precisely* the sort of thing to pass to someone to hook them on a game right away. Do you design your character sheets yourself? They’re very cool. I spend much too much time on them, to shich Brand can attest. I should say, to those of you that admire my character sheets, that some of the stuff on them is theived, theived, theived. I yoink images of people, places, things off the net and store it in a folder for inspiration for when I need ideas. Sometimes a character gets strongly attached to one of them. Sometimes I build a character off an image entirely. But I design them and make them myself. I am in the process of learning to draw, too. I should also say that I did Morgan and Katya. Mo and I do so many things colaberativly that it’s hard to keep track sometimes. I just wanted to say to you (and Brand) that those character sheets rock so much it hurts! They make me wish I lived in Toronto and knew you guys (I already wish I lived in Toronto for other reasons, but you know what I mean). 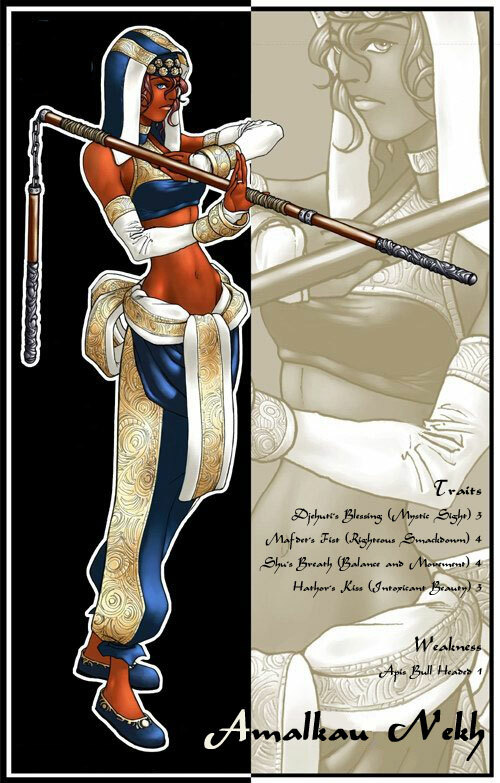 Is Amalkau a Wushu character, and if so, what was the setting? You made my day with these (particularly hers). Sorry for the shallow post and late response, but it sounds like your gaming style and mine are similar and I’ll try to weigh in on more serious theoretical issues eventually. She is indeed. 🙂 It was a short lived campaign that was an Indiana Jones/Mummy kinda game. The other character was a two-fisted archaeologist with perfect timing who found himself in competition over an amulet with Amalkau, the last scion of a dynasty that had been the ushers of the Godswife. The amulet had been stolen generations before, and her family had been cursed, their number decreasing like an hourglass over the centuries. You have a blog/site/home somewhere? That’s cool. I’ve been on a Wushu kick lately and that presentation of a character brought home to me evertything that I like about simple systems and all of the power of imagery and graphic presentation to get people into and excited about a game. I’m afraid I don’t post as much as I’d like, and it’s mostly me whining about my disatisfaction with my recent gaming, but give it a look if you’d like.